Welcome to the world of Fantasy Earth, a world of gritty, low fantasy role-playing, where even mighty warriors fear a knife in the back and powerful wizards get nervous around loaded crossbows. 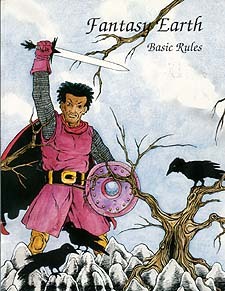 While Fantasy Earth is filled with action, role-playing is emphasized. The success of an adventure often depends more on careful planning than heroic battle, and your list of allies may matter more than your list of spells. Fantasy Earth breaks the traditional rule that realism requires complexity by replacing pages of tables and charts with a simple target number resolution system. Non-combat skills are resolved on a simple d10, and many combats can be run without even opening the book! This book does not contain the rules for magic. You must also have the Fantasy Earth Book of Magic to use the magic system.